In a 9-inch skillet, add olive oil and heat over medium high. Add potatoes, onion, salt, and pepper. Cook for approximately 15 minutes until potatoes are crispy. 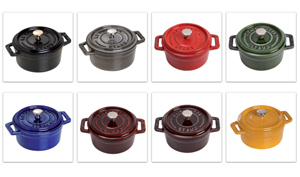 In Staub mini oval cocottes divide up potato mixture. In a separate bowl, whisk eggs, and pour on top of potato mixture in mini cocottes. Top with cheddar cheese. In a 400 degree oven, bake frittatas for approximately 15 minutes, or until egg is cooked and cheese is melted. Serve immediately. Makes 2 delicious breakfasts or brunches.